I was watching a horror movie last night and it reminded me of teaching math and science to my children. I’m kidding, of course, but only slightly. But here’s the thing: if you recognize the source of that fear, you will begin to realize that the fear is unfounded. Most parents struggle with one or the other of two thoughts: it is either the desire to spark an interest in the subject and finding that they cannot (or do not have any of their own) or it is the fear that they will not be able to sufficiently explain something. I write often about my own boredom during homeschooling on my blog, so I get it. But one thing about math and science is that even though they can seem dry to those of us that prefer the arts is that these subjects just are. A thing is a thing is a thing. Two plus two is always four. There is a sort of comfort in that. So even if it’s not “fun,” it is just dealing with facts. 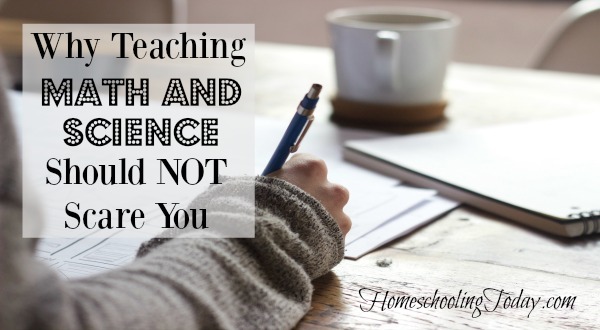 This makes a homeschooling parent’s job easier not harder, or it should anyway. If all we’re dealing with is factual information then I don’t need to worry about creating anything new. We’re living in the Information Age. It’s everywhere we look. And luckily for us, curiosity comes built in our children. If we don’t kill it, it grows and takes a life of its own. And all we have to do is present the facts and let the children soak them up. The second concern is the fear that the parents might not be able to adequately explain something to their children. This is exactly what excites me about homeschooling. Sometimes, parents come to homeschooling with a template in their heads. I know I did. I pictured children sitting around the dining table with workbooks and sharpened pencils. I didn’t like it. I pictured a blackboard. We still don’t own one and have never missed it. I have realized the truth that there is no template. Sooner or later successful homeschooling parents come to see this, as I did. Knowing that there is no template, no “right way” to homeschool clears up a lot of this fear. If parents don’t understand something, there is always a way. They can ask someone else, they can find out themselves (which is by the way what I see as the single best thing about homeschooling – a family learning together!) or they can delegate this specific issue to someone else. Most parents are quite willing to let someone else take over teaching a musical instrument to their children, but bristle at the idea of letting children learn a specific aspect of math or science from a tutor or even a relative. Instead, they should rest assured to know that there are other creative solutions to these concerns or better yet, start thinking about them. My father in law, for example, is an entomologist and you can bet your last dollar that every question my children have about anything insect-like is going straight to him. The horror flick I was referring to was a good story precisely because no one could figure out why. Why were the horrible things that were happening to them occurring at all? No one could figure out why and this mystery was what kept us going in spite of the bad makeup. Of course, the sound effects and visuals added to all of this, but at its heart, the reason we continued to watch the movie was to figure out why. This grappling with a reality as presented to us, this questioning, this curiosity is not something that needs to be taught. It is part of being human. Your kids have it as much as you do. Nor is it necessary for you to have all the answers. 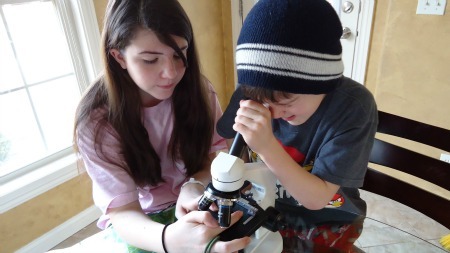 The searching, the learning together is what makes homeschooling fun. Have you heard the phrase, “It doesn’t have to be fun to be fun?” This is doubly true in math and science. Don’t avoid it. Embrace it. Enjoy the journey as well as the destination. The point is – you can do it. And that voice in your head that says you can’t is a lie. It is just as much of a lie as that idea of what homeschooling looks like. It always was. It’s time you found out for yourself. 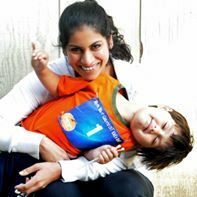 Purva Brown is a writer and a classically unschooling mom of three. She blogs at The Classical Unschooler. Follow her on her Facebook page. Prev Are You Homeschooling For Today or For The Future?